A melt in your mouth winning combination of our homemade creamy caramel, enrobed in decadent dark chocolate and sprinkled with just the right amount of sea salt. Each of these flavorful gems is handmade by our world class candy makers. 24 Sea Salt dark Chocolate Caramels in a red gift box. 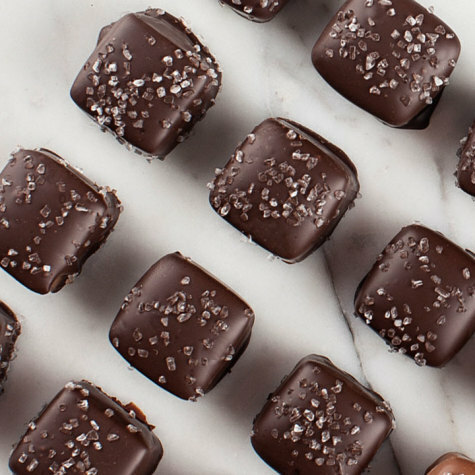 These dark chocolate sea salt caramels are very good. The best I have tasted in a long time! I sent this as a gift and received a 10 review. My only regret is that I was not there to have a taste. Bought this as a Valentine gift for my husband. He LOVED it! We always enjoy your sea salt caramels...first rate! The dark salted caramels are outstanding. We are really enjoying them and will probably order again.